CD, 18x14cm, in thin sleeve, 5eur. Recorded october 13th 2011 at Kule theater, Berlin, by Christoph Schlimbach. Mixed by Gaudenz Badrutt & Jonas Kocher. Mastered by Giuseppe Ielasi. Thanks to Rafal Mazur for the title. The two musicians collaborate for many years in different formations in improvised music contextes. 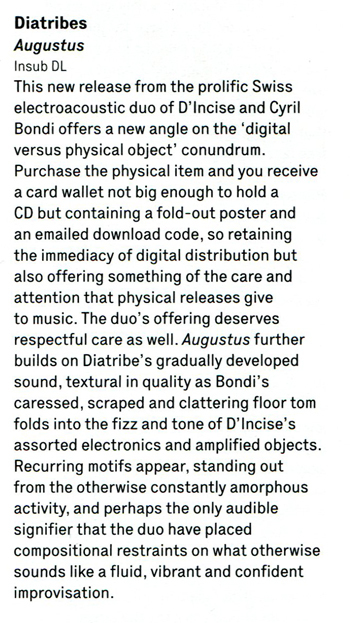 The duo developp a subtil work that explores the relations between the very electronic sounds of the accordion and the instrumental potential of the electronic. They create a fragmented and tensed sound univers, always open to the present and the accidents. Accordion player and composer born in 1977, Jonas Kocher studied a.o. with Teodoro Anzellotti, Pierre Sublet and Georges Aperghis. He collaborates regularly as accordionist in improvised and conceptual contexts with musicians such Michel Doneda, Christian Wolfarth, Olivier Toulemonde, Hans Koch, Alfredo Costa Monteiro, Duo Diatribes, Jacques Demierre, Christian Kesten, Gaudenz Badrutt, Chris Heenan, … . Jonas Kocher’s work explores the relationships between tone, noise and silence and the processus of listening. As composer he realises projects which are situated between composed theatre, installation and concert pieces. His compositions has been played at Biennale Bern 2010, Jardins Musicaux 2012, SMC Lausanne, Theater Basel, Zentrum Paul Klee, Festival Encuentros Buenos Aires, Umlaut Festival Berlin, Centre Dürrenmatt Neuchâtel, Festival Concentus Moravie, Zagreb Biennale. He composes also for hörspiel, dance and theatre. Jonas Kocher runs the label Flexion records. Gaudenz Badrutt (electronics & computer) began his career as a pianist in the field of contemporary classic music. Since 15 years he works as an electronics musician in the field of improvised, experimental music. He is mainly known as one half of the electroacoustic duo strøm (together with Christian Müller, electronics and bass clarinet), as well as part of the duo Hans Koch (bass clarinet) – Gaudenz Badrutt and the duo with Jonas Kocher (accordion). His music is coined by a very instrumental use of computer/live sampling and electronic devices. Filigree, minimal noises, drones and dense structures are key characteristics of his music. He is further occupied in the fields of electronic composition and sound & video installation. Gaudenz Badrutt has further collaborated with Bertrand Gauguet, Burkhard Beins, Michael Vorfeld, Norbert Möslang, Dieb13, Diatribes, Arno Camenisch a.o.. with concerts at home and abroad, including: the JOLT Festival Basel 2011, Zwei Tage Zeit Zürich 2012, Influx Toulouse 2011, Transmediale Berlin 2009, Zoom in Bern 2008, Norberg Festival (Sweden) 2006, Taktlos/Tonart Bern 2006. Gaudenz Badrutt lives as a freelance musician in Biel (Switzerland). 33 minutes of subdued, generally solid bumping of heads between Kochar (accordion) and Badrutt (electronics). For most of the work, there’s a fine sense of evolving form, the soft hums, taps and breaths gently swirling into shape, dissipating, re-forming into related figures. Kochar, while more often than not using various extended techniques, largely on the air-rush side of things, isn’t averse to injecting standard accordion sounds and does so very well, playing the instruments richness against the astringent, softly piercing whines that Badrutt conjures forth. At its best, the music is very spare but very gentle, smoky wisps in a dark space. However, about midway through, it veers into a bit of a rambunctious patch, not bad but somewhat disruptive (debating whether that’s a good thing here, undecided) and some accordion-led eeriness that’s uncomfortably close to old horror-movie shenanigans. That segment doesn’t last too long, but it’s soon replaced by a kind of manic traffic jams sequence, replete with tooting « horns ». As I said, the disruption bothers me most of the time but occasionally, it makes a kind of sense, a sideways sort of slant into a room that may be adjacent but also « out of place ». Apologies for the vagueness, but at any rate, the music here got me thinking along those lines. Try for yourself and see. The 32-minute eponymous piece that comprises this CD by Jonas Kocher and Gaudenz Badrutt takes place on a bed of silence. In fact, one could call silence the third member of the group. Yet this silence is not empty; it is potent and simmering, with a life of its own. A thirty-three minute of carefully placed sounds and well chosen silence, I’d say. This is one of those works were you hear something, short, and then nothing, a bit longer. Action and interaction music. Its not always easy to say who starts the action, but perhaps they alternate between each other, and perhaps they both start every now and then, while at other times they both stop. But on a few occasions they collide mid air and when they bump they go on collision course which actually may take some time. This only happens maybe three of four times here. It’s here that they sustain their sounds for a while and deliver more tension to the music, even more than to the other parts. It’s full on, intense listening and playing going on that requires your full attention. You can’t play this while doing something else (I tried and failed). Stay focussed. The musicians, so why shouldn’t you? Le duo Kocher/Badrutt présenté sur la compilation de duos avec Jonas Kocher m’avait déjà interpelé et c’est donc plutôt avec joie que j’ai reçu cette autre pièce d’une trentaine de minutes, improvisée par ce même duo accordéon/électronique. Le même registre est exploité, dans un contexte aussi minimaliste et très interactif. Kocher continue d’explorer les registres extrêmes de l’accordéon, des registres qui s’entremêlent facilement avec l’électronique (notamment les aigus proches du larsen, mais aussi les bourdons très graves, constants et légers). De son côté, Badrutt tisse des fils très ténus, sensibles et délicats, des drones aigus ou très graves irrégulièrement rompus par des brusques interventions sonores qui peuvent paraître acoustiques: sortes d’interventions bruitistes qui pourraient faire penser à des objets lourds entrechoqués après un calme de plusieurs minutes. On retrouve énormément de bourdons légers, à peine perceptibles, des bourdons qui laissent parfois « entrevoir » des sons extérieurs et étrangers. Mais aussi le même intérêt pour les dynamiques propres aux timbres et aux modes de jeux, ainsi qu’un intérêt pour la tension et l’intensité propres au silence et au calme. Car ce sont bien ces deux termes qui peuvent qualifier la majeure partie de cette improvisation: un calme constant malgré des irruptions violentes sporadiques, ainsi qu’un silence toujours sous-jacent et tendu. Encore une fois: du beau travail – recommandé. Vid sidan av Flexionrecords verkar Insubordinations just nu släppa några av de intressantaste plattorna inom vad som kunde kallas experiment eller elektronika eller akustiska rollbyten. Jonas Kocher ägnar sig åt både skallöppningar och den fintrådigaste hjärnkirurgi på lyssnarna.